News Report for the 12th of April - 1945The American President is dead. 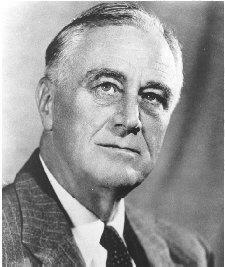 It has just been announced that the second most famous Roosevelt, Franklin Delano Roosevelt, has died at the age of 63. Franklin Delano Roosevelt was only 3 months into his 4th term of office as President and has been replaced by the Vice-President, Harry Truman. Franklin D. Roosevelt has consistently been rated in the top 3 of American Presidents, along with President Martin Sheen, who had a seven year term in the West Wing of the White House, and Morgan Freeman who head butted an asteroid. David Palmer, friend of Jack Bauer, tends to always come fourth. News Report on the 11th of April - 1960Reports are just coming in that Jeremy Clarkson has just been born. Jeremy Clarkson, future host of the BBC car show, Top Gear, sped out of his mother at over 90 miles an hour before performing a handbrake turn and proclaiming his mother's womb the warmest and most comfortable womb ... in the worrrrld. A few minutes later he found out they weren't going to serve him any hot food and promptly punched the midwife in the face.